A few days ago, I read an article on how to effectively reflect on the past year and use it to propel you forward. One of the suggestions was to name your year. I typically do this at the start of a new year (I already have my word for 2018 and will be sharing that soon!) but I’ve never paused to give a word to the year that has passed. I loved the idea so much and decided to declare 2017 the year of LEARNING for Lily & Val. I’m excited to pause and re-cap this whirlwind year! You can be sure a “year of learning” means there were many mistakes, new obstacles that pushed us past our comfort zones, and ultimately difficulties that gave us new perspectives and clarity. The year was also filled with some major accomplishments and bucket list items. I’m grateful for each milestone and how it’s shaped this little company and me personally. Thank you to everyone for coming along on this journey! Most of all, I’m grateful for all of you because, without your support, there would be no re-cap to write! In January we kicked off our year of hygge! This theme of “coziness of the soul” really did permeate our entire year, especially during a Pittsburgh winter. In March, we introduced our Chalk Lettering Tool Kit! Putting all of my tools and favorite products together in a kit was a dream of mine ever since The Complete Book of Chalk Lettering came out in 2015! Each one is hand-assembled right here in Pittsburgh. Also in March, we held our very first workshop at the Lily & Val Flagship Store! It was a Chalk Lettering Techniques class and these attendees were the first to receive a Chalk Lettering Tool Kit! The year brought more workshops to Pittsburgh, like our Faux Floral Wreath class! March was a busy month because we also introduced our Spring in Provence print collection filled with designs inspired by a special trip I took to France. The coming of April brought National Letter Writing Month! We wanted to make a splash in celebrating the art of snail mail, so we released 10 new cards in the shop! In May, Mak and I appeared on KDKA Pittsburgh Today Live! 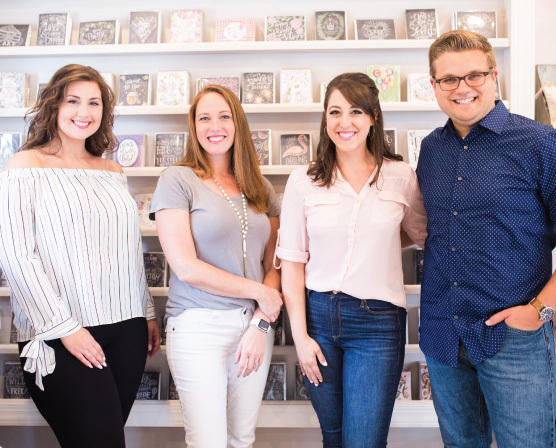 We also headed to New York City for our second year at the National Stationery Show! It was an amazing week, but what blew us away the most was The Chalk Lettering Tool Kit winning not one, but TWO awards including overall “best of show” and best new product in “Craft it up/DIY”. I still chuckle when I see this photo taken by the NSS team when they gave us the award. Mak’s expression sums it up. In June, we celebrated 5 years of L&V!! It’s still amazing to me that 5 years ago I pressed publish on an Etsy store that was supposed to be a hobby. It’s humbling. We celebrated with a party in the office and a card grab bag! In July we launched our Recipe Collection featuring a brand new product – loose recipe cards! Also, in July Emily and I went to Atlanta Gift Show to find new lines to carry in our Pittsburgh store. One of my favorite collaborations to date also happened in July when Lily & Val stencils were released! What a dream it was to work with such a well-known and respected company in the craft world – Plaid Crafts! It was truly an honor and a thrill to see them in Michaels Stores across the country! July brought some changes to the L&V team and shifted our roles. This was one of the many moments 2017 pushed me past my comfort zone. We also welcomed our new Shop Assistant, Nicole, to the L&V team! If you’ve written to us this year, you would have most likely communicated with her! Also, in July we held our Summer Retirement Sale and said goodbye to dozens of classic L&V designs. Many of these designs had been around since I started the shop on Etsy! We had never retired so many designs at once before. Lily & Val saw growth in 2017 that we hadn’t experienced up to this point! We had a lot to figure out and learn (that word again!) Growth can sometimes seem glamorous, but there’s a lot going on behind the scenes that is anything but! There were multiple times the team came together for long hours of assembly parties in the office to fulfill orders for major retailers. August brought our brand new home on the internet! We also released the Fall Collection! This collection was especially meaningful and significant to me because it marked a shift in my artwork. I drew this collection after feeling a pull for simplicity. My heart was craving slow, a fresh start. I admit I was nervous to release it since I felt it was very different. I was especially worried about the scrawled and sketchy F. Scott Fitzgerald poem, but it ended up being a favorite from the collection! I tried to push myself artistically this year and learned a lot along the way. As part of the Fall line, we also introduced another brand new product- L&V Canvases! August took me back to San Francisco to film two new classes with Brit & Co! One was for chalk illustration and the other was a watercolor lettering illustration class. So much fun! In September, I had the privilege of collaborating with TLC and their agency to create a series of illustrations for the Little Couple! The Lily & Val Flagship Store turned one in October and we celebrated with an Anniversary Open House! The 2017 Holiday Collection, which we named “All is Calm,” also launched in October. The art and the heart behind it followed the same thoughts from the Fall Collection. I wanted the designs to feel like a breath of fresh air. Another new product came with our Holiday Collection – the Holiday Gift Tracker! This was a product created because I really needed it and it was a thrill to see how well it resonated with you too. In November, we revealed a brand new cover option for our best-selling Keepsake Kitchen Diary™! The whimsical lemons cover gave a sunshiny and cheerful pop to this beloved product. I always love partnering with Starbucks! This year, they sent me this fun “cup decorating kit” to make their holiday cup design my own. December began with our L&V Surprise Box launch! We had no idea what to expect, but you all blew us away when the boxes sold out in just 20 minutes! We’ve been working behind-the-scenes to bring you more boxes in the future! The second wave of the Anthropologie collection hit shelves! Two tea towels plus two travel mugs rounded out the holiday product offerings. Again, it’s just surreal. Speaking of surreal, I wrote an article for the Martha Stewart Living Blog about how to draw chalk snowflakes! I gasped when I saw the below photo posted on the Martha Stewart Instagram! We wrapped up December with our company dinner and office gift exchange. What. A. Year. As 2017 with its ups and downs comes to a close, I feel so hopeful and excited about 2018. I have a renewed sense of direction and confidence moving forward. I can’t wait to share more about this in the coming weeks. Again, I can’t say thank you enough for your continued support and encouragement. It means the world to me. Thank you for following this little journey. So happy for all of the amazing things that went on you your sweet company! I can’t wait to see more of what is to come in 2018! Please excuse to typing error! I had no idea this company was so new! I think because my husband bought me my first handlettering book—your chalkboard writing book—several years ago, I thought every aspect had been going along with it as well. This has been fun for me to be a part of your first year. I’ve loved every item I’ve purchased❤️ May your new year be grand as well …I know I’ll be ordering along the way!! !